The second-generation (2004+) Prius has filed down its rough edges, increased its stylistic differences from the cheap Echo, and adapted to customer requests. Some of the changes include a larger interior, sheet metal and interior detailing that seems to have undergone a number of tweaks to become rather attractive, a magnifying glass making the instrument panel more easily visible, a better stereo, and a larger, more user-friendly, less distracting LCD display. The unique exterior appearance makes it unlikely anyone will confuse it with an Echo (which, despite sharing a platform, is very different in every meaningful way), and invites quite a bit of comment from strangers and neighbors - almost as much, indeed, as the PT Cruiser did when it first appeared, and more than a Corvette. We've heard some people say that hybrids are, in their words, underpowered, puny roller-skates. Unlike them, we've actually driven a Prius. The ride is comfortable, cornering capable, interior space generous, and asking price quite reasonable. For about $20,000, the price of a well-optioned Civic, you can get a high-mileage car that's practical, unusual, fully featured, and eye-grabbing - and, even though all the technology is still new, quite probably reliable. Owners of the first-generation Prius seem to be quite happy with their choice, and we have yet to meet any who ran into the predicted problems with batteries, major system failures, or the like; the Prius seems to have compiled a reliability record on par with the Corolla, Echo, and Camry. Backing up the new technology is an 8 year, 100,000 mile warranty that covers the traction battery and a number of hybrid-specific components, and a five-year, 60,000 mile general powertrain warranty. The Prius is not a Chevette, Pinto, or Tercel; nor is it a Honda Civic hybrid or a Honda Insight. 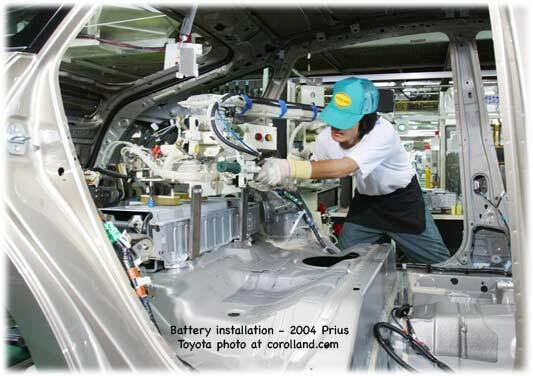 The Prius was designed from bottom up to be what it is, the most advanced mass-produced hybrid-electric car in the world - which might be why it can run on pure electric, pure gasoline, or both. 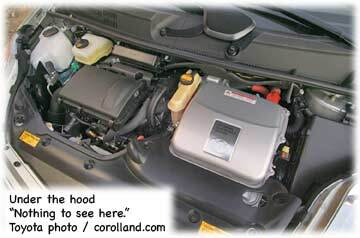 Gas mileage is also only one part of the story; the gasoline part of the engine burns very cleanly, too. Some have noted that its real-world gas mileage is not much higher than that of a Volkswagen Golf diesel, but the Golf is considerably smaller, and the Prius not only burns fuel more cleanly, but also has an automatic transmission, by far the choice of American drivers. Acceleration is roughly the same as a four-cylinder automatic Camry, which is similarly sized and priced, at around ten seconds zero to fifty. Thanks to the instant torque of electric motors, highway acceleration is surprisingly good. When shutting the car off, you're supposed to press the Park button, then press Power, then remove the key fob; but if you press Power, the car goes into park automatically, making the process easier. If we jumped the gun and tried to go right into gear, the Prius sometimes balked; you are supposed to wait for the Power button to indicate that everything is ready. It takes little time to do this, but it doesn't happen instantaneously. This is not unlike a diesel, which often needs to warm up for a moment before starting. 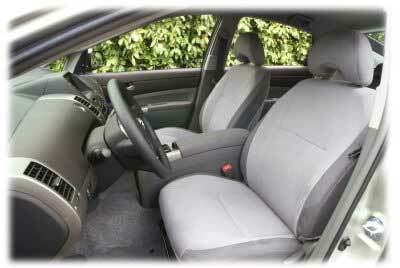 Once inside, you may notice that the interior has been quite substantially upgraded for a much classier look. The vast expanse of empty dashboard has been toned down, partly by using two colors, partly by relocating the instrument panel itself so it is largely in front of the driver (rather than dead center), and partly by varying the shapes and materials. Now, slightly purplish metallic-looking panels are combined with chrome metallic-looking trim and a matte black piece under the window for a much improved overall feel; and the center stack has a smoked plastic overlay which is more rich-looking than most cars' stacks. The theme is carried over to the rest of the car; for example, the center console's dual cupholders are covered with those smoked plastic pieces. While leather is "in," the Prius uses a very soft, plush-looking fabric with a leather-style appearance that is more comfortable than any leather we've seen, and doesn't get especially hot in the sun. We'll take this fabric, which is also used on the door and center armrests, any day - but then, we've never been into fashion. The largest feature of the Prius' interior is the LCD screen in the dead center of the dashboard, above everything else, and considerably larger than any screen we've seen in competing cars, since every Prius has one and it was specifically designed to be the control center. On this touch-sensitive display, surrounded by seven large mechanical buttons, you adjust the climate control, the stereo, and the standard navigation system. (Oddly, it has no provision for customizing the car's features, such as locking habits and lighting - unlike other models bereft of LCD screens). The touch-sensitive aspect of the display makes setting up the navigation system far, far easier than on any competitor without it, and the navigation system itself is more fully-featured than many. Those features are also easier to use, because they're accessible by a simple touch rather than through a byzantine menu system. To change map preferences, you press the icon you want to change (e.g. whether up is North or where you're heading); and to move the map, you touch the part of the screen you want it to move to (it'll also give you a street address and, if possible, a description of the location - such as parking lot). Just about everything is far easier than on non-touch-enabled navigation systems. That's an advantage which is hard to emphasize enough, because the spin-the-dial-and-press-the-obscure-button method of navigation is truly annoying when you're in a hurry; the touch screen and the large screen together make this navigation system far superior and easier to use. The voice controls add to that, though we found they didn't always work as expected; presumably with more time we would get used to the system and speak the way it wants us to. It is easier and safer to speak "zoom in" than to press the buttons for it. Anything that avoids distraction is worthwhile, and this system, unlike its predecessor, is quite good at minimizing distraction. The audio system includes controls on the steering wheel for volume, mode, and tuning, as well as mechanical buttons in the center stack for commonly used features. To adjust bass and treble, you press Audio next to the nav system, then Sound on the touch-screen, then pushbuttons on the touch screen. The sound of the optional JBL-tuned system far better than we'd expect on a Toyota; either way, the adjustments are not as difficult as on the first-generation Prius. The audio system automatically switches to CD, tape, or radio displays and buttons when needed, allowing it to have large, well-labelled, but not confusing controls. Climate control is also adjusted from both the wheel and the console; front and rear defrosters, air conditioning, and air recirculation all have their own buttons on the wheel, along with temparature up and down. This means that drivers only have to press the Climate button next to the touch-screen to adjust the fan and vent system, though every control that's on the wheel is also on that screen. The system is just about as easy to use as a standard climate control, which is a credit both to Toyota's engineers and to the decision to make the touch-screen as large as it is. 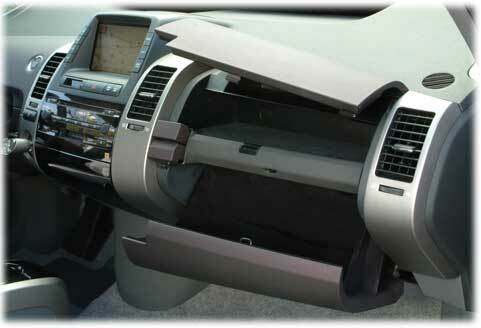 There are a large number of handy places for stuff, including two - count them - two glove compartments, one above the other, with separate openings; the top one has two shelves, while the bottom is a conventional, but huge, single bin that can easily hold a bunch of letter-sized papers. Both front doors have large map pockets, both front seats have map pockets sewn to their backs, the capacious center console bin has a removable upper rack that doesn't get in the way of the main area, and there are two padded spaces for sunglasses and such - one integrated into the bottom of the center stack, the other overhead. Rear cup holders fold out of the front console without any loss of console function. 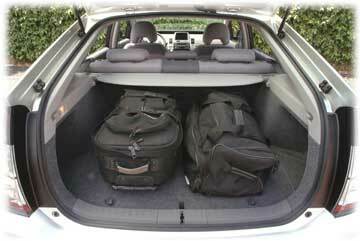 The cargo bay is long but not deep; access is easy thanks to the hatchback style common to other continents. Underneath the carpet is a separate storage bay for shallow items, and a vinyl shade can be pulled over the cargo area to keep prying eyes at bay. The sound system is built in and integrated with the center stack, in a way which makes replacement with an aftermarket unit problematic at best. Fortunately, the optional JBL system in Package #8 is quite good. It includes a six-disc in-dash CD changer and cassette player; the only real oddity is the separate power button, given that the volume control (and for that matter the tuning button) pushes into the dash. The climate control works surprisingly well, with the air conditioning and heating operating even under battery power, though it is not without quirks. The air conditioner compressor seems to always activate air recirculation, which, to be fair, can easily be shut off from the steering wheel. The automatic mode, which is activated by default when using the wheel-mounted a/c button, tends to run the fan fast and very loud. To get started, you press the On button; if your foot isn't on the brake, that gives you what would be the Accessory position in normal cars, which turns on the big LCD display and the radio, but doesn't let you use the power windows. If you do put your foot on the brake, pressing the Power button will start the car; the engine may or may not go on, but you can then shift into gear and drive off. Shifting is done by a game-style stick, which you push into position, encountering little resistance; it then snaps back into place. (Pushbuttons would probably be easier.) There are two forward positions, Drive and Brake; Brake uses the generator to convert velocity into power, and is intended for use for short periods of time on steep hills (going down). In normal driving, the engine tends to stay on when you're cruising or accelerating, with the electric motor kicking in for added power. When you coast, the engine shuts off, and a slight drag occurs as the generator kicks in to recharge the battery. This gives you the same feel as a conventional automatic, which also has drag when you're coasting in Drive. Transmission "creep" is also built in; lift your foot from the pedal, and the electric motor will silently move you along, slowly, just as the engine of an automatic-equipped car would. It is possible, through very slight use of the pedal, to accelerate to a reasonable city-street speed using just the electric motor, but it's not easy and other motorists will get impatient. Most of the time, the engine kicks in to get you going. It takes a while to get used to having the engine starting and stopping routinely. This is not harmful; the engine was designed for it, and it is one of the things that allows the Prius to get its superb gas mileage. Conventional engines are started by a starter, which simply rotates the engine while fuel is injected and spark plugs fire; unless the engine is rotated, the engine won't start. 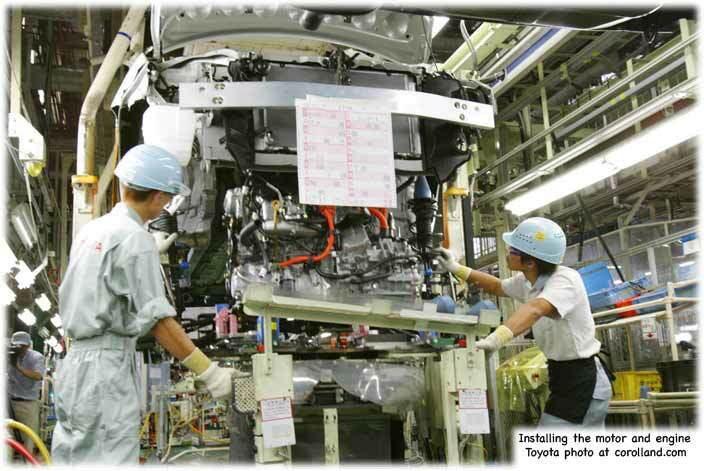 The Prius uses the electric motor to get the car moving, and then the gas motor starts the same way, only it doesn't need a starter, because it'll move by virtue of being connected to the transmission. (Manual-transmission Opels use a similar trick - they shut off fuel to the engine when you're coasting in gear, and resupply it when you hit the clutch or brake - so drivers never know about it.) On the highway, the first generation Prius used to have a considerable shudder when changing modes, but the current one has a less intrusive change, making highway driving much more enjoyable (it's still there, but many drivers won't notice). Acceleration on the highway is quite good, with the continuously variable automatic transmission smoothly changing ratios at the same time as the electric motor kicks in with more power. This makes passing surprisingly easy, especially when compared to the slight delay sometimes encountered in going from a stop. Downshifting is very smooth, since the transmission is passing through a continuously lower set of ratios, rather than making a single large dip; acceleration is not marred by the usual large second-to-third automatic transmission step. Overall, we experienced 41 mpg on a driving program almost designed to keep mileage low (by comparison, we get 28 mpg with a stick-shift 1995 Dodge Neon). That includes relatively short trips that don't allow the engine to reach full efficiency, and many stoplights on 40 mph roads; as our trips lengthened, gas mileage generally went up to 50 mpg. In stop and go traffic, you really can reach the EPA-rated 60 mpg, but Toyota itself notes that it is only allowed by law to cite EPA ratings. In short, don't expect to get 60 mpg; but do expect far, far better mileage than any other sedan of similar size. Highway mileage is about 50 mpg at 55 mph, but it falls off as speed increases and wind resistance takes a toll. Rapid acceleration also causes a hit, though that's true of any vehicle (our Spirit R/T mileage ranged from 12 to 25 depending largely on how much we leaned on the gas pedal!). 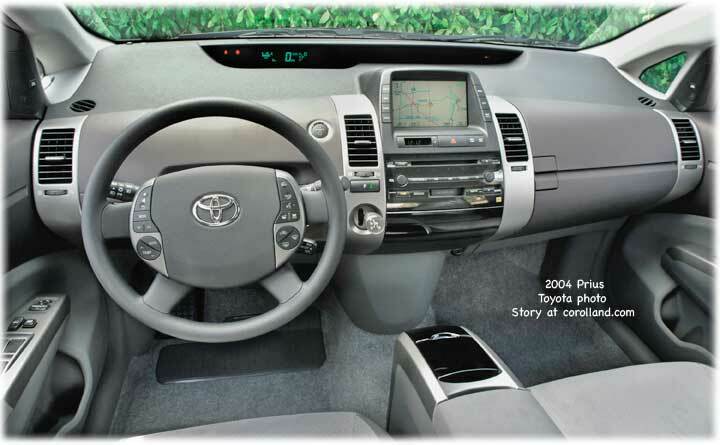 There are few compromises with the Prius: interior space is mid-sized, in line with other $20,000 vehicles; luggage space is a little more sparse, but it's conveniently laid out; handling is on par with many other sedans; and the number of features (side airbags, active suspension, alloy wheels, traction control, antilock disc brakes, power heated mirrors, six-speaker CD, automatic climate control, air, remote entry, cruise, tilt wheel, and power locks and window) is certainly competitive. If this was a conventional gas-powered car with 10 mpg less, it would still be oversold. Our test car was a bit pricier, at just under $24,000, including the voice-activated navigation system, rear wiper, Smart Entry, JBL stereo with cassette player, and the inevitably overpriced floor mats. We do recommend getting the nav system, given its usefulness and the unusually large touch-screen; a number of option packages are available (ours was #8). While the Prius has a standard active suspension, which uses the powertrain, antilock brakes, and other components to increase stability, it also comes with Goodyear Integrity tires, a strange choice for an otherwise well thought out vehicle, since their traction is less than ideal. Even handicapped by Integrity tires, the Prius corners quite well, but the tires tend to chirp a bit on takeoff, and around sharp turns. Uneven surfaces do not seem to hurt traction much, but they do cause more tire squeals. A quick tire change would not add too much to the price, but would be very helpful in making the car seem sportier, but then, Toyota sedans aren't normally mentioned in the same breath as BMW (this isn't necessarily bad, since BMW opts for cornering over ride). On the highway, the Prius can easily handle sharp turnoffs at high speed. The ride is firm but not bouncy or too busy, and nasty shocks are cushioned. Bumps do not resonate - you can't hear them, just feel them. Wind noise is a bit high on the highway, making us suspect that Toyota lightened the car by using thinner glass. The brakes are effective, which is especially good considering that they are not just brakes, but are also power generators. Hitting the brakes actually throws in the generator (the electric motor, that is), which puts power back into the battery for use later. It's quite clever, though it takes a while to get used to the brake feel and stopping can be a little rough at first. But that's presumably why we test cars for more than an hour or two; it's so we can find out that, yes, you do indeed get used to the brakes, not to mention the engine shutting off when you coast or stop. Likewise, the electric power steering becomes "normal" after a while. Though a true auto enthusiast would probably shudder at the thought, just before throwing ripe tomatoes at us, electric steering isn't bad, and most people won't notice it after a while. Visibility is very good, thanks partly to the little glass triangles in front and back, which really do help. The rear is reminiscient of the second-generation Honda CRX, with two glass panels separated by a steel bar; the optional rear wiper is not totally necessary. The front wiper is cleverly designed with a cam action to sweep as much of the windshield as possible; the arms are different lengths as well. The Prius is styled with the 1990s "more glass is better" ethic, which helps visibility, though it does let the interior heat up quite a bit in summer. Fortunately, the air conditioner is better than we expected - though of course that takes a hit on gas mileage. Overall, we found the Prius to be a competent sedan that could sell for $20,000 just based on Toyota's reputation and its own features and comfort; getting about fifteen miles per gallon more than just about any other automatic-transmission vehicle of its size is gravy. Some aspects take getting used to, but on the whole, it's an excellent choice for those who want to reduce our dependence on oil companies and nations of dubious ethics, or who wish to reduce air pollution, or who simply want an interesting, gadget-filled vehicle to drive.